For the contemporary (c. 3200-2300 BC) Scandinavian culture with a similar name, see Pitted-Ware culture. 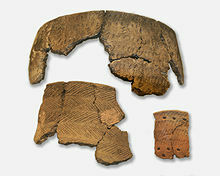 The Pit–Comb Ware culture or Comb Ceramic culture was a northeast European characterised by its Pit–Comb Ware. It existed from around 4200 BCE to around 2000 BCE. The bearers of the Comb Ceramic culture are thought to have still mostly followed the Mesolithic hunter-gatherer lifestyle, with traces of early agriculture. The distribution of the artifacts found includes Finnmark (Norway) in the north, the Kalix River (Sweden) and the Gulf of Bothnia (Finland) in the west and the Vistula River (Poland) in the south. In the east the Comb Ceramic pottery of northern Eurasia extends beyond the Ural mountains to the Baraba steppe adjacent to the Altai-Sayan mountain range, merging with a continuum of similar ceramic styles. It would include the Narva culture of Estonia and the Sperrings culture in Finland, among others. They are thought to have been essentially hunter-gatherers, though e.g. the Narva culture in Estonia shows some evidence of agriculture. Some of this region was absorbed by the later Corded Ware horizon. Comb ceramic pottery from Estonia, 4000-2000 BCE. The ceramics consist of large pots that are rounded or pointed below, with a capacity from 40 to 60 litres. The forms of the vessels remained unchanged but the decoration varied. By dating according to the elevation of land, the ceramics have traditionally (Äyräpää 1930) been divided into the following periods: early (Ka I, c. 4200 BC – 3300 BC), typical (Ka II, c. 3300 BC – 2700 BC) and late Comb Ceramic (Ka III, c. 2800 BC – 2000 BC). However, calibrated radiocarbon dates for the comb-ware fragments found (e.g., in the Karelian isthmus), give a total interval of 5600 BC – 2300 BC (Geochronometria Vol. 23, pp 93–99, 2004). Among the many styles of comb ware there is one which makes use of the characteristics of asbestos: Asbestos ware. Other styles are Pyheensilta, Jäkärlä, Kierikki, Pöljä and Säräisniemi pottery with their respective subdivisions. Sperrings ceramics is the original name given for the younger early Comb ware (Ka I:2) found in Finland. A so-called Giant's Church at Rajakangas, Oulu, Finland. The purpose of these large, rectangular stone structures is unclear. The settlements were located at sea shores or beside lakes and the economy was based on hunting, fishing and the gathering of plants. In Finland, it was a maritime culture which became more and more specialized in hunting seals. The dominant dwelling was probably a teepee of about 30 square meters where some 15 people could live. Also rectangular houses made of timber become popular in Finland from 4000 BC cal. Graves were dug at the settlements and the dead were covered with red ochre. The typical Comb Ceramic age shows an extensive use of objects made of flint and amber as grave offerings. The stone tools changed very little over time. They were made of local materials such as slate and quartz. Finds suggest a fairly extensive exchange network: red slate originating from northern Scandinavia, asbestos from Lake Saimaa, green slate from Lake Onega, amber from the southern shores of the Baltic Sea and flint from the Valdai area in northwestern Russia. The culture was characterised by small figurines of burnt clay and animal heads made of stone. The animal heads usually depict moose and bears and were derived from the art of the Mesolithic. There were also many rock paintings. According to Mallory and Adams, the dominant view before 1997 was that the spread of the Comb Ware people was correlated with the diffusion of the Uralic languages, and thus an early Uralic language would have been spoken throughout this culture. However, another more recent view is that the Comb Ware people may have spoken a Paleo-European or Paleosiberian languages , as some toponyms and hydronyms also indicate a non-Uralic, non-Indo-European language at work in some areas. Even then, linguists and archaeologists both have also been skeptical of assigning languages based on the borders of cultural complexes, and it's possible that the Pit-Comb Ware Culture was made up of several languages, one of them being Proto-Uralic. Kudruküla (Narva river mouth) 5,600-year-old Pit-Comb site shows Y-haplogroup R1a5-YP1272 and mt-haplogroups U5b1d1, U4a, U2e1. Y-haplogroup R1a5-YP1272 14,000 years ago has a common ancestor with the main Indo-European haplogroup R1a-M198. Overall, PCW to the south-east of the Baltic sea had the following autosomal components: 65% "ancient East-European hunter-gatherer" (first attested in the Kunda culture but with a 4-fold lower percentage); 20% "Yamna" (never before attested in the north); 15% "ancient West-European hunter-gatherer" (the main component of the Kunda culture). ^ Marek Zvelebil, Pitted Ware and related cultures of Neolithic Northern Europe, in P. Bogucki and P.J. Crabtree (eds. ), Ancient Europe 8000 BC–AD 1000: Encyclopaedia of the Barbarian World, Vol. I The Mesolithic to Copper Age (c. 8000-2000 B.C.) (2004). ^ "Arvoitukselliset jätinkirkot". Keskipohjalaisia museoita ja kulttuuriympäristöjä (in Finnish). Keski-pohjanmaan liitto. 26 January 2013. Archived from the original on 9 November 2013. Retrieved 26 January 2013. ^ James P. Mallory and Douglas Q. Adams, "Pit-Comb Ware Culture", in Encyclopedia of Indo-European Culture,( Fitzroy Dearborn, 1997), pp. 429–30. This page was last edited on 11 December 2018, at 18:48 (UTC).